Tire them out! 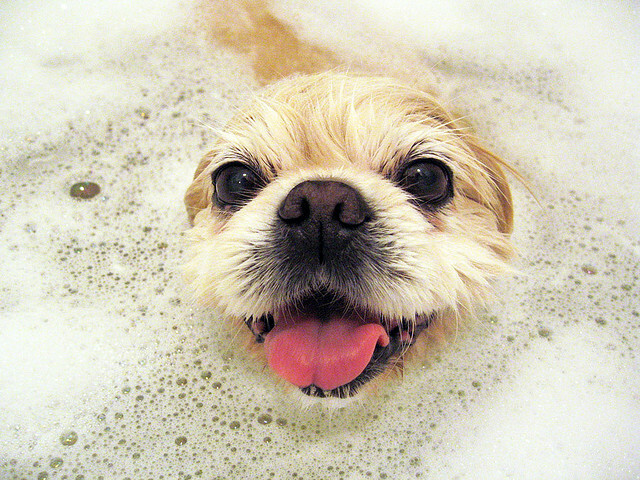 If you’re bathing your pup, take him out for a long walk where he gets a chance to play or chase a ball. If you’re bathing your kitty, engage in some active playtime (with enough rest time afterwards for your cat to settle down). The more tired and relaxed your furry friend is, the easier your job will be. Clip Nails. If you have a squirmy pet, we recommend carefully trimming his or her nails beforehand so as not to risk scratching. Here’s a helpful guide to trimming feline nails, and for pups, read here. Get your station ready. We’ve all been there – finally wrangling our pet into the bath or sink only to realize the shampoo is across the apartment. Save yourself the headache and prep everything beforehand. Don’t forget a towel or two! Lastly, stash plenty of treats in your pocket to give him or her before, during, and after. Don’t forget to praise, praise, praise! Find the right temperature. For both dogs and cats, you want to use luke warm water. Any hotter and they may feel uncomfortable – remember that a warm bath is not as soothing to them as it is for us! A non-skid mat will make your life much easier. If you don’t have one, a towel will do. For cats, you may want to fill the tub or sink beforehand if running water distresses your kitty. Keep ears and eyes dry. Never attempt dunking your furry friend’s face underwater. Instead, use a washcloth to wipe around the eyes and nose. Inserting cotton wads into Fido’s ears beforehand will ensure that they stay nice and dry. The last thing you want is a wet dog furiously shaking his head! Remember, patience and staying calm is key here. If you’re frantic or annoyed, your pet will be more likely to resist, making the task even harder. Good luck! Photo by Shoehorn99 via Taildom.